Patient adherence to the prescribed regimen is all too common of an issue; and the reasons for non-adherence can vary from patient to patient. One of the most common reasons however, is economic barriers. We’ve all experienced it - patients who try to stretch a 30 day supply into a 45 day supply, or in the particular case of supplements, those who substitute your recommendation in the hopes of saving money. 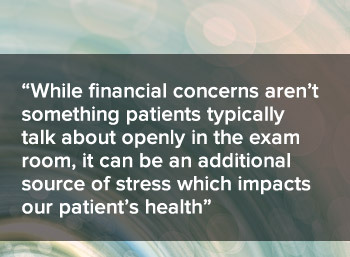 As healthcare professionals, we play a critical role in adherence, and while financial concerns aren’t something patients typically talk about openly in the exam room, it can be an additional source of stress which impacts our patient’s health. Therefore, it’s critical that we address all factors of non-adherence, finances included, to ensure our patients achieve optimal results. It’s no secret that patients who are educated on their health are more likely to adhere to a regimen. However, patient education doesn’t stop at having an in-depth understanding of “why” they feel the way they do; it’s also about the “how” a specific regimen can help them. The “how” includes a clear understanding of the instructions, the purpose, and the details of the regimen, resulting in shared decision making between you and your patient. Once a patient understands how a particular set of recommendations is going to help them, you can address some of the financial factors; including the cost/benefit factors of what the long-term looks like if they don’t adhere to the plan – such as increased visits or lost time from work. I’m not suggesting we start by asking patients the details of their financial status, but rather that we address the topic as an element of our consultation, including providing a daily cost breakdown of what’s being recommended and getting patient feedback, while providing easy access to tools which can address their concerns. I find the HSA and FSA reimbursement form particularly important because most patients do not know that if a nutritional supplement is recommended by a medical practitioner that it could be a “medical expense deduction” according to the IRS. Even this basic piece of information can make a significant difference in removing what may be a financial barrier. If recommending supplements, consider using a “superbill” format which can easily be used to facilitate reimbursement. Recommendation ranking goes hand in hand with patient education, as a patient needs to know the impact of every product or lifestyle change you are recommending. Ranking can also help limit feelings of becoming overwhelmed - both financially and in the lifestyle changes to ensure they stay on track. Another tactic that works well is product sampling. Nothing speaks louder than results; if a patient is hesitant to follow your recommendation, provide a few days’ worth of product samples. Once a patient feels the difference, they can more easily justify the expenditure.